Get your retro-toned blues on. NAMM 2014: Absara Audio, the company behind the relaunch of mythical amp brand Supro, has revealed the full line-up of new amplifiers. The new range kicks off with the S6420 Thunderbolt 9 (SRP $1099), a 50th anniversary reissue that features vintage specifications including a cathode-biased 6L6 output section, 'Blue Rhino Hide' tolex covering and a 15" Supro TB15 speaker. Next up is the S6420+ Thunderbolt(+) (SRP $1199), an upgrade to the reissue Thunderbolt featuring a 3-way rectifier switch option for a choice of 35-watt (cathode-biased) or 45-watt (grid-biased) 5U4 tube rectifier modes and a high power 60­watt (grid-biased) solid state rectifier setting. The 1624T Dual­Tone (SRP $1099) is a 24 watter with a matched pair of 6973 power tubes and a custom designed 12" Supro DT12 speaker. The Dual-Tone features two channels, each with independent volume and tone controls which can be linked, and a footswitchable tube tremolo with speed and depth controls. The Supro 1690T Coronado (SRP $1249) is a 2x10 combo with a 2-channel tremolo preamp and a Class­ A, 35-watt dual 6L6 output stage powering a pair of custom designed 10" Supro CR10 speakers. Finally comes the limited edition S6450R Thunderstorm (SRP TBA), a new design employing two parallel channels, 3-knob tone stack, footswitchable gain boost and an all tube reverb coupled to a 6L6 Supro power plant featuring 3-way (35W / 45W / 60W) rectifier switching options for studio, club and large venue gigs. For more information visit the official Supro website. Absara Audio, the New York based manufacturer of Pigtronix effects and Supro amplifiers has unveiled its debut lineup of re-issue Supro tube amplifiers for Winter NAMM 2014. Reimagined by award-winning product designer, David Koltai, with circuits curated by Bruce Zinky, the new Supro amps bring back the instantly recognizable looks, tactile feel and raw tone that defines the Supro sound. 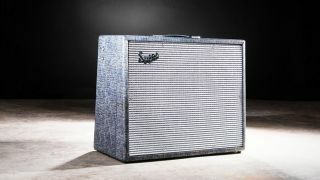 S6420 Thunderbolt: The logical starting point for a revival of Supro amplification is a USA made, 50th anniversary reissue of the iconic 1964 Supro Thunderbolt 1x15 combo. True to vintage spec, this legendary amp's cathode-biased 6L6 output section produces 35 watts of pure rock n' roll power at a price that working musicians can afford. Dressed in unmistakable "Blue Rhino Hide" tolex and sporting a custom designed 15" Supro TB15 speaker, the Thunderbolt returns to stages and studios worldwide in 2014 with a MAP price of $1099. S6420+ Thunderbolt(+): A hot rod upgrade to the reissue Thunderbolt, the S6420+ model adds modern headroom and gigging versatility to the original design via a 3-way rectifier switch option for a choice of 35-watt (cathode-biased) or 45-watt (grid-biased) 5U4 tube rectifier modes as well as a high power 60­watt (grid-biased) solid state rectifier setting. MAP price on the S6420+ is $1199. 1624T Dual­Tone: By far the most sought-after of all vintage Supro amps, the compact and club friendly 1624T Dual-Tone delivers a raucous 24 watts via a matched pair of 6973 power tubes and a custom designed 12" Supro DT12 speaker. The Dual-Tone's two channels, each with independent volume and tone controls can be linked together for ultimate flexibility and wide-range sound. A footswitchable, tube tremolo with speed and depth controls completes this recreation of the most coveted Supro tube amp at a MAP price of $1099. 1690T Coronado: The Supro Coronado was the premier amp of choice for the South-side Chicago blues players of the early 60's. Staying true to Supro tradition, the 2x10 Coronado combines the flexibility of a 2-channel tremolo preamp with a robust Class­A, 35-watt dual 6L6 output stage. powering a pair of custom designed 10" Supro CR10 speakers. This bonafide blues monster carries a MAP price of $1249. S6450R Thunderstorm: The all-new Thunderstorm is a retro tube fantasy design employing two parallel channels, 3-knob tone stack, footswitchable gain boost and an all tube reverb coupled to a tricked out 6L6 Supro power plant featuring 3-way (35W / 45W / 60W) rectifier switching options for studio, club and large venue gigs. The Thunderstorm will be produced in extremely limited quantity throughout 2014 and will carry a MAP price TBA. All of these USA made Supro amplifiers will begin shipping to dealers in May of 2014 from the newly constructed Absara Audio manufacturing facility in Port Jefferson Station, New York.